Ryan Howard rounded the bases on Saturday afternoon after launching a Bartolo Colon pitch into the seats in right center and smiled as he crossed home-plate. Seconds later, he reemerged from the Phillies' dugout obliging a raucous crowd with a curtain call. 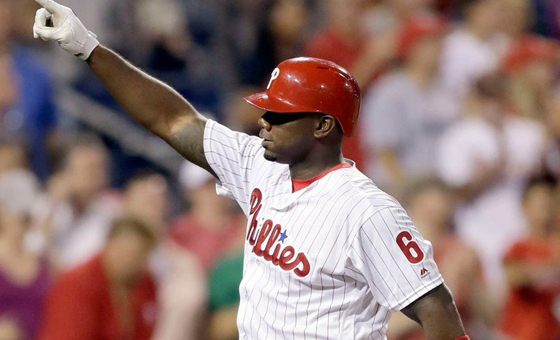 The slugger is putting the bow this weekend on a career that spans 13 major league seasons with the Phillies. Saturday's blast was the 382nd home run of his career and moved him into a 67th-place tie on the all-time list with Jim Rice and Frank Howard. "I’m just trying to enjoy it, trying to embrace everything and take it as is," Howard said. "I’m not trying to look too much into anything. Actually, I’m just trying to go out there and win these ballgames. I mean, I think, I’ve said it before, things will hit you when they hit you." Howard has a club option on his deal with the Phillies for 2017, but the organization is undoubtedly going to opt for the $10 million buyout instead of paying $25 million to a 36-year-old first baseman that has hit .219 over the past three seasons. Howard is the lone holdover remaining on the Phillies roster from the 2008 World Series campaign. Sunday's contest against the Mets will mark his last appearance in a Phillies uniform, though he technically will remain on the roster until the Phillies formally decline his club option. The club will have a special pre-game presentation for Howard, starting at 2:30 p.m. before Sunday's season finale. "I'm just myself. Again, [Sunday] with whatever it brings, I'll embrace it and take it and enjoy it," Howard said.